Abita Ridge is St. Tammany’s newest subdivision development, located in the heart of Covington, Louisiana on the scenic Abita River. The property consists of 60+ beautiful acres of land. While 40 of those acres will be dedicated to home lots, the remaining land will be set aside for a family park area and facilities, scenic views, recreation trails, and green space. Abita Ridge is more than just a neighborhood – it's a community, and any good community comes with amenities for the residents. When we build Abita Ridge, we handpick everything in the recreation center and more. Our community park and green spaces will allow our residents to get to know one another and enjoy the gorgeous atmosphere! We plan to be not only welcoming and inviting, but private so you feel secure and safe in your new home community! Our beautiful Abita Ridge logo is going to be displayed on stucco in the front of the neighborhood, and the neighborhood will include two brick entrances. Take a look at our detail Phase 1 map to get an insight into the future of the neighborhood! Flood zones are displayed on the map as well as the section train system, greenspace, lots, active recreation area, streets, and more. Neighborhood will include Restrictive covenants to protect property values. 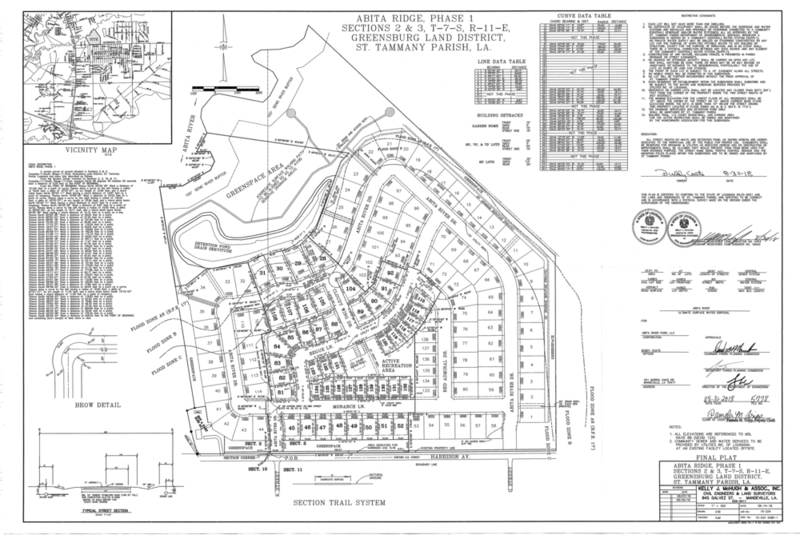 This map displays all current lots in Abita Ridge that are for sale or spending/sold. Lot sizes vary to accommodate different size homes and price ranges. Regarding flood zoning, all are either flood zone C or X with central water sewer, electric, and gas utilities. Abita Ridge will have underground utilities and street lighting. The neighborhood will showcase a large conservancy nature area leading to the Abita River, complete with walking trails. The Recreation Area will include a soccer field, 1/2 court basketball, picnic tables, & more!